Tom was the tallest player on the court… And there wasn’t a close second. The next tallest player on the court didn’t even come up to his shoulders. He was huge. So you know what I did… I planted him in the key and told him not to move any time that we were on defense. And we won the grand final. Every time we were on defense he would run back to the key and stick his hands in the air. He wasn’t a great player. He didn’t block many shots or grab many rebounds. But his sheer size caused the opposition’s best players to miss most of their layups. Was the tactic I used (planting our biggest player in the key) smart coaching? But was it a smart tactic for a youth basketball coach who claims to be passionate about the development of players? Once upon a time, I would have said yes because I didn’t know any better. And a lot of current coaches would agree with me. Now that I’m more experienced, I would say an emphatic no. 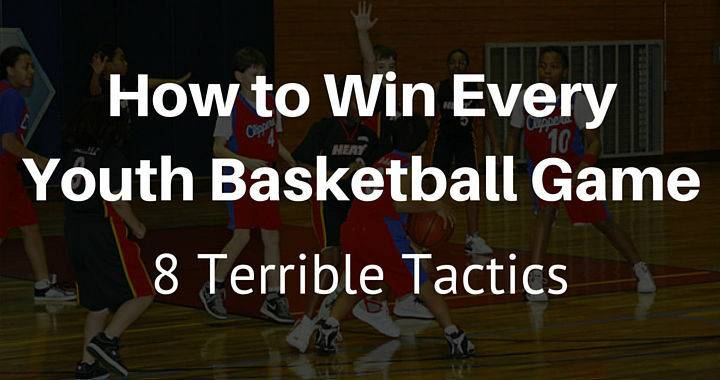 But this tactic (and many other similar tactics) are used on a regular basis in today’s youth basketball. What was I depriving Tom of when I forced him to stay inside the key the entire game? • He doesn’t get a chance to practice closing out. • He doesn’t get to practice evading off-ball screens. • He doesn’t get to experience fighting through on-ball screens. • He doesn’t get to practice guarding the basketball on the perimeter. Not to mention that I was also depriving other players of learning how to play help-side defense because we already always had Tom permanently there. They didn’t need to. I was hurting the entire team’s development because I wanted to win the game more than I wanted them to get better. Sorry, Tom. If I could go back and change how I coached that game, I would. Even if it meant we lost the game. Many of the tactics that win youth basketball games are detrimental to the long-term development of our athletes. These tactics are most commonly used by coaches who aren’t aware of the consequences or coaches that are only concerned about stroking their own ego and winning games. The first sign of a coach who only wants to win is one that plays their best players as much as possible and their weaker players only sparingly. They’re not interested in even court time. They start the game with their 5 best players on the court and will only rest them when they’re fatigued to the point where they can’t possibly run any longer. Only then will they ‘risk’ putting in a weaker player. As soon as their starter is ready to go again, they’re straight back onto the court and the weaker player is back on the bench. Every youth basketball coach should strive to give all of their players relatively even time on the court. There is no substitute for in-game experience when developing basketball players. For me, the only time I will deviate from even court time is in the last 3 – 5 minutes of a close game, then I’ll put in the players who I believe give us the best chance of winning the game. But up until that point, everyone should be receiving even court time whether you’re winning or losing. This is the most common tactic used by coaches that aren’t concerned with the development of their players. I’ve written extensively on why zone defenses are ruining youth basketball which you can read here so I’ll keep this short. Basically, since most youth players aren’t physically strong enough to shoot the basketball with good technique or consistently from outside, coaches take advantage of this by leaving them open on the perimeter and packing the paint with defenders. Then they simply wait for the offense to miss an outside shot so that they can rebound the basketball and play offense. When a coach does this, they’re depriving their players similarly to how I did in my U12’s basketball game to Tom. The players won’t be able to practice closing out, fighting through off-ball screens, defending the pick-and-roll, etc. Running a 2-3 zone isn’t ‘smart basketball’ like a lot of youth coaches seem to think it is. I believe all youth basketball teams should be playing man-to-man half-court defense. I don’t mind teams using the Pack Line defense although some will argue that it’s similar to running a zone defense. I disagree with this and see the Pack Line as a progression to man-to-man defense by teaching younger teams the correct help positions without them needing to think about denying the basketball as well. Whether to use a full-court press was something I debated with myself over and over again when I first started coaching youth basketball. …because they’re too effective. Full-court presses flat-out work in youth basketball. Here’s why they work and how it’s hindering the development of our players. As stated in tactic #2, youth basketball players are weak. To effectively beat a full-court press requires good spacing amongst the offensive team and the strength to make passes over and through the zone. Since youth players often lack the strength for good spacing, the defense doesn’t have to worry about the long pass over the top of the defense and they can simply flood the front-court. This inevitably leads to a lot of turnovers and the game turns into a ‘run and gun’ shootout. This isn’t a good thing for youth basketball development. Your team should play man-to-man half-court defense. This allows the opposition to advance the basketball and then the offensive team and defensive team can work on half-court fundamentals which are much more important for development. If you’re a parent and a coach ever tries to restrict your child to playing one sport all-year-round, run away. Run as fast as you can. Coaches will often use this tactic to get good athletes to 100% commit to them, their team, and their chosen sport. Keeping the best athletes on their roster all year around will lead to them getting more wins on the scoreboard. They’ll tell parents and players that if they do take a season off basketball that they’ll get left behind and won’t be able to catch back up. This has been proven time and time and time again to be untrue. Encourage your players to play multiple sports. The benefits are countless. The player will develop into a better all-around athlete, they’ll experience different sports and be given the chance to decide their favorite, they’ll develop more relationships, they’ll receive coaching from different coaches, etc. But not even just the benefits, there are dangers associated with being a single-sport athlete including burnout, injuries, etc. Another way to immediately know if a coach has their values and priorities in order is if they scream and yell at young referees. How often have you seen young, intimidated referees fade from the game after being yelled at and intimidated by a 40-year-old man or woman? I see it all too often. Some youth coaches will often use this tactic knowing that it will benefit their team throughout the game. As much as we would love for all referees to be unaffected by coaches, it happens. All referees have to start somewhere (just like coaches) and the young beginner referees will be affected by what coaches say to them. If you’re yelling at them throughout the game, they will get intimidated and perhaps a few calls will go in your team’s favor. Don’t sink to this level for a couple of extra calls. Stop talking to the referees and focus on the team you’re coaching. Don’t expect the referees to make every call correctly. You’re not a perfect coach. Your players aren’t perfect shooters. So why do some coaches expect the referees to be perfect? Youth coaches that only care about winning only want the basketball in the hands of their best players. It’s common to see these coaches instructing the weaker players on the team to stand in the corners to ‘space the floor’ while the better players on the team isolate on the wing or the top of the key. When the weaker players do receive the basketball, they’re often yelled at if they shoot the basketball or drive to the basket. How are they going to improve if all they’re allowed to do is catch the basketball and pass back to the better players? Encourage your weaker players to a make the correct basketball play even if that’s shooting the basketball and they miss. Another tactic I use is when our team is winning by a comfortable margin, I get the players that don’t usually advance the basketball up the court to become the point guards of the team. The biggest players on your team are required to play in the post and rebound, right? Coaches instruct the biggest players to be the ‘big men’ on the team. That’s the way it’s always been. Their role involves rebounding, playing in the post, and setting screens. Nothing else. “Because that’s what big men do”. This isn’t restricted to games, even in practice a coach will often split their team up into ‘post players’ and ‘guards’. The post players only work on post skills and the guards only work on guard skills. Tall players are often yelled at when they dribble the basketball up the floor or shoot from the outside. Coaching youth basketball this way has to stop. One of the main reasons is that the biggest players on a youth basketball team are often guards when they advance to the next level. We can’t restrict a player in the future by assigning them to only one position. You never know how they’re going to grow and develop in the future. This is now one of my most important rules for youth basketball. I made the mistake of separating guards and bigs when I first started coaching (read about it here) but with experience I’ve learned better. Allow all of your players to experience and practice advancing the basketball up the court, shooting from the outside, playing in the post, etc. Another sign of an inexperienced coach or a coach who’s focused on winning is the amount of set plays they use on the offensive end of the floor. Because they give your players a pass from thinking and make decisions on offense. Instead, your players already know where they should pass the basketball, where they should cut, when they should dribble, when they should shoot, etc. By running set plays every time down the floor, you rob your players of the opportunity to make decisions and develop their basketball IQ by learning from experience. Not to mention I’ve watched coaches work on their set players for 75% of practice. This is a huge waste of time that could be better spent playing small-sided games or working on skills! Use a basketball offense that gives the players the opportunity to make decisions. My favorite youth basketball offense is the Read and React offense by Rick Torbett. Often I’ll simply stress spacing and ball-movement to young players and then let them work it out on their own. Sure, it’s not always pretty basketball, but they learn a lot! They play their 5 best players as much as possible. Run a tight 2-3 zone. Don’t allow players to play multiple sports. Only allow their best players to control the basketball and shoot. Force big players to only play in the post. Only run set plays on offense. The most important thing to know is that you’re not a bad coach if you’re currently using any of the 8 tactics above. All coaches are guilty of making the mistakes above at times throughout their youth basketball coaching career. I’ve (unfortunately) used nearly all of the above tactics at some stage in my coaching journey. I understand that it’s not always intentional. Most coaches don’t think these tactics will have a long-term impact on the players (just like I didn’t), but they do. Hopefully, by writing this I’ll save you the time of working them out yourself! We all have to remember what’s most important in youth basketball (development, participation, fun, etc) and stop letting our ego’s get in the way. Can you think of any more ‘terrible tactics’? Share them in the comments!